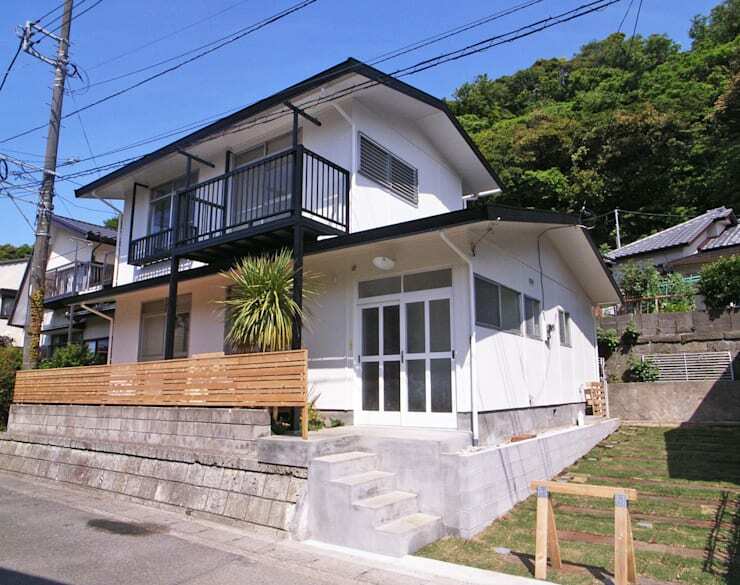 This modern Japanese house definitely contains some interesting features, with a mix of contemporary and traditional design seamlessly throughout. There is a positive inclusion of natural fibres and materials in the interior, such as the general use of wood in decking, flooring, counters and frames for doors and windows. The result is a very peaceful and natural abode which honours space and light. The house has an open-plan living area for cooking and relaxing, with front-facing verandah and upstairs balcony for valuable outdoor space. The exterior of this house contains a few notable signs of its location. The design of the roof and balcony might suggest some eastern influences. 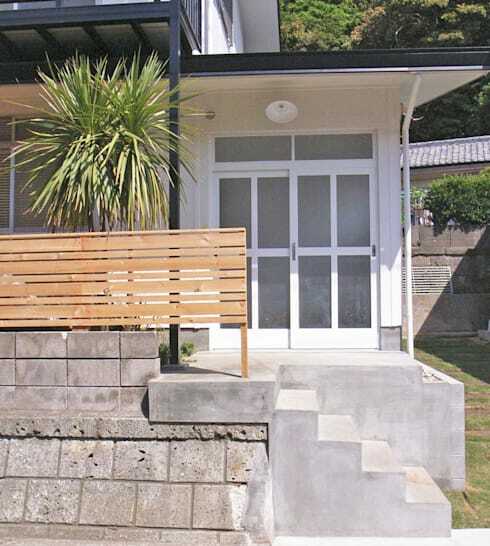 The use of wood/bamboo as a see-through fence or border, plus the sliding front doors and raised entranceway are other signs that might lead you to the correct conclusion of a modern Japanese home. We see here a minimalistic approach in the interior designer's mind. However, there is also an emphasis on modern living and a desire to be open, as well as promoting a certain calmness through the use of a light and a basic colour scheme. White with grey, silver counters and natural light wood seem to invite peace and imply a laid-back, easy-going atmosphere where one person might eat and another might read a novel, as they sway from side to side under the rather modern looking (almost New York-esque) ceiling. The long breakfast counter could easily be fashioned with high stools for social family meals, not unlike those used in a sushi restaurant. The entrance hall of a Japanese house is known as the 'genkan'. It usually has a space where people take off their shoes. Traditionally, people pointed the tips of their shoes to the door or outside. In most homes there would be a shelf or cabinet called a 'getabako', on which to place shoes and store slippers. For more great examples of windows and doors check out this Ideabook. 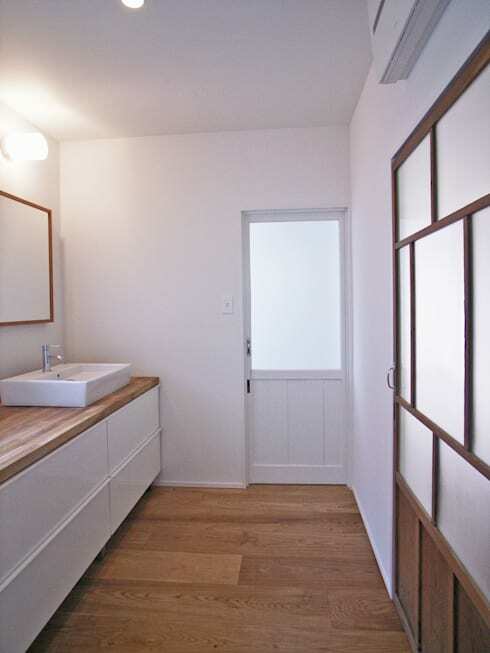 The use of wood adds much to this property's natural and simplistic design. 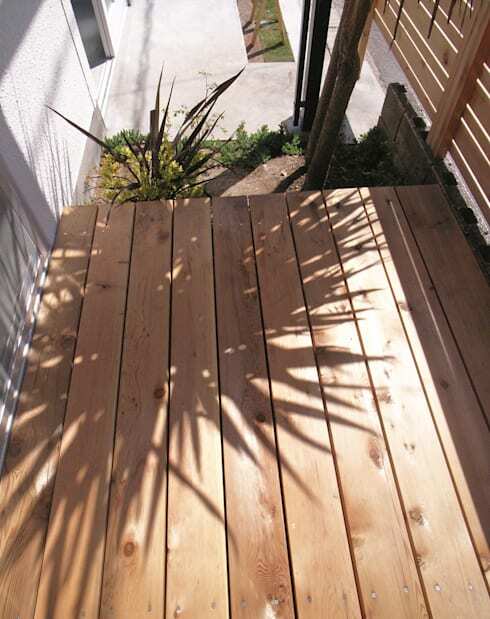 This front decking area could be the perfect place to cultivate some beautifully coloured flowers and perennials. Adding some wicker (or bamboo) chairs and a small table will provide the perfect little haven for meditation and morning tea. The use of sliding doors here is to promote light in a very open-plan living area. Leading to the front ground floor veranda, this would be a lovely room to open up on those warm spring and summer days, airing the house with fresh air and the aroma of blooms from the front balcony. 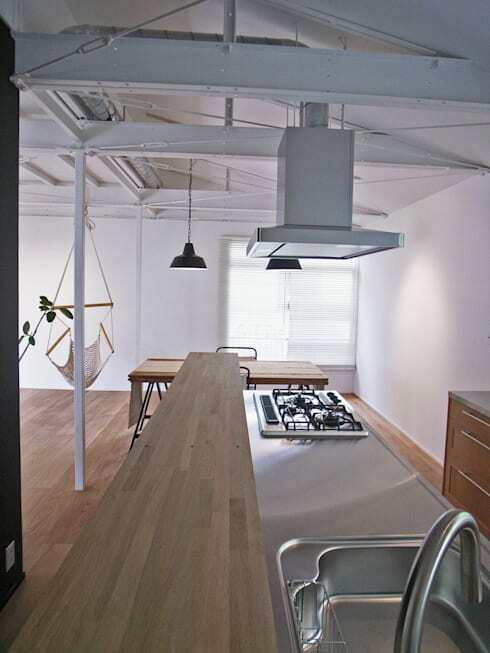 This dining space is part of the kitchen and also the living area. Would it benefit from a few choice plants and paintings, perhaps? 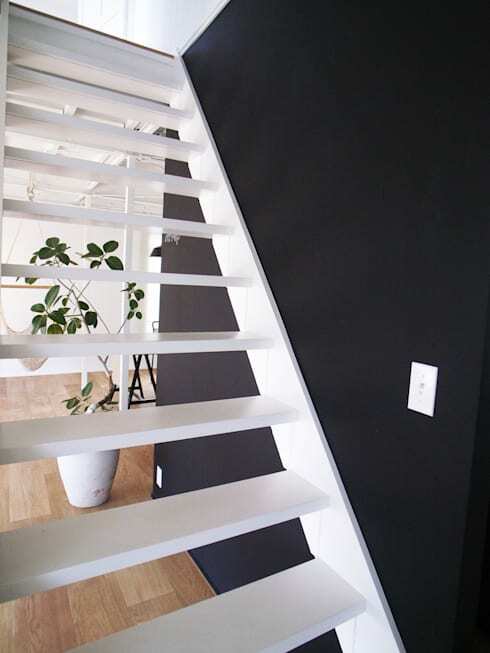 The designer's use of black and white as a natural opposite proves striking and effective. The open stairs work well in maintaining the theme of space and balance which runs like a quiet stream through the house. 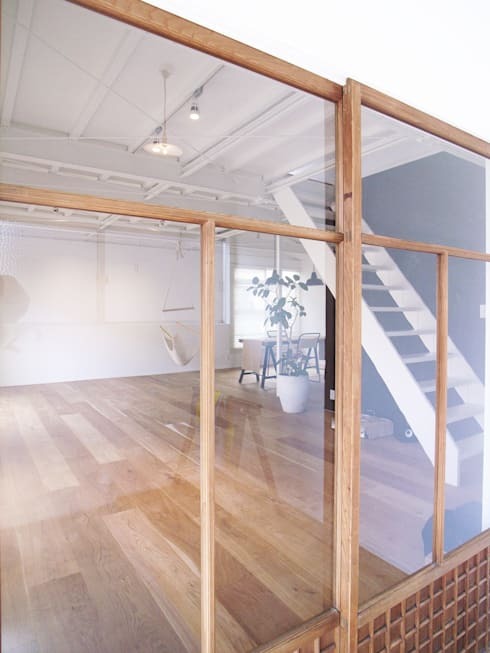 This stylish sliding door is very much reminiscent of the kind we might see in ancient Japanese housing. It is based around what the Japanese call a 'shōji', which is a door (or wall) made of paper. Although the paper allows light to penetrate, it would be opaque rather than see-through, and usually panelled in various arrangements according to the designer. The paper panels are framed by wood or bamboo. 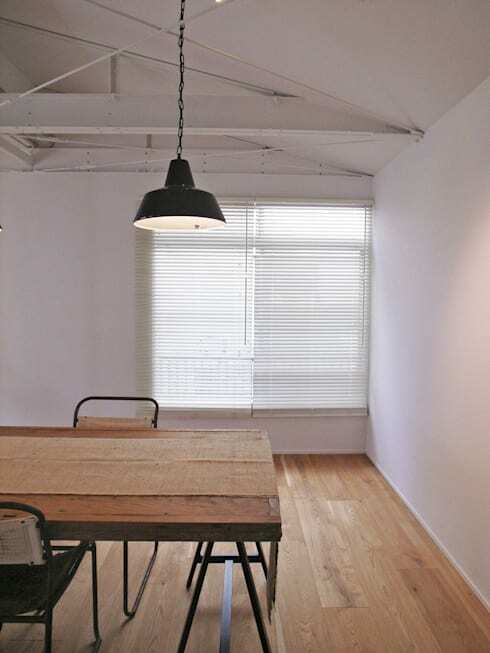 A stylish extra would be to lay down 'tatami', a Japanese flooring comprised of rice straw, which, together with shōji walls, has the effect of tranquility itself. How could you add your own touch to a tranquil gem such as this?